First result when I googled "ninjas and frogs in japanese culture." Looks like it was from folklore. I guess I learned something today. 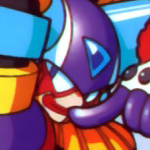 Just like in Mega Man 6 and that one Mega Man fighting game that had Shadow Man. What is it with Ninjas riding giant frogs?